Description: In the mountains, a boy named Son Goku lives in total seclusion until one day he meets a young treasure hunting girl named Bulma - meanwhile in a small kingdom, the king has grown cruel and greedy in the hunt for the highly valuable Blood Rubies. For kids all over the world, Dragon Ball has played the role of their first introduction to the shounen manga genre. The tale of a young boy, his friends and their action filled hunt for the legendary seven dragon balls that can fulfill any wish has proven to be such a popular genre the the series has spun off several video games, four cartoon shows, a slew of merchandise and of course a long line of movies. This time we're looking at the very first Dragon Ball movie, Curse of the Blood Rubies. 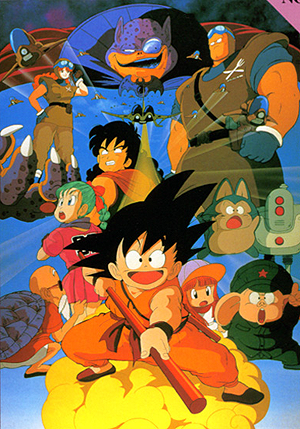 The movie is centered around a small kingdom ruled by a king that has recently grown malevolent and has a extreme hunger he believes can only be removed by the magic of the dragon balls, he sends out his two elite soldiers to find the remaining balls he needs, meanwhile the movie also retells the first four or five chapters of the original series as we get the origin of Goku and Bulma's meeting, as well as a re-introduction for Master Roshi the turtle hermit, Yamcha the bandit and Oolong & Pool the two shapeshifting animals. As far as the retelling goes, I have to admit that while I perfectly understand their reasons for doing so I had far preferred they'd kept the origins out of the movie. The original stories the introduced the characters were pretty heavily grounded in the raunchy comedic nature of the show and some of the best moments have been left out - most likely due to the perceived age-rating of the film. However to their credit the writers of the film has managed to keep the spirit of the series very much alive and all the characters have their personalities intact. It should also be mentioned that this film has a running time of a meager 47 minutes, so it doesn't outstay it's welcome at all. If you're familiar at all with the show, you know pretty much the standard fare for what you're in for. Goku is our super strong but fairly naive and stupid hero that saves the day with the help of his more world-weary cynical allies that are pretty much only in it for themselves. As far as Dragon Ball movies go, the storyline for this one is pretty good - Dragon Ball is a very action heavy but also storyline oriented series so trying to make something that fits somewhere into the story can be pretty trying - most of the time, the movies will mix up who were alive and had what powers at a certain point of the series. That's probably why they initially decided to make the movie take place at the very beginning of the story, making this some sort of alternative plotline. The actual big bad of this plotline in the series was the vindictive Prince Pilaf, who is nowhere to be found in this movie. The villains have very simple designs compared to almost all other instances this series has ever seen, a low amount of color and more focus on body type is also a witness of how early on in the run the movie was made. Our main villain is kept in shadow for most of it, and does look interesting one he's finally revealed but the villains we spend the most time with are just two people in uniform. It's simplistic, but in the context of the story it works very well. By this time in the series, we had yet to be introduced to the major science fiction aspects the show would later encompass, and as such the film as much more of a medieval fantasy feel to it with Bulma's Capsule Corp. technology being the only real reminder of the shows setting most of the time. The animation of the movie is also very simplistic, I imagine it was done on the same budget as the show as it makes high use of still-frames to tell it's story. While mostly good, there is the case of the character of a little girl made especially for the movie, she's the films main character outside of the series mainstays and while she has a simple and cute design very akin to the iconic Akira Toriyama art style, the animators decided to animate some of her hairs separately and that unfortunately gives off the effect of her looking like a glorified Raggedy Ann doll. I watched the Funimation version of the film, so I was treated to the English voice cast. While it's certainly apparent that the cast has become much better since it actually turned out to be a decent enough dub. Of course at times the difference in sound level between the high quality microphones used for the dub and the background music did become fairly obvious but never to the point that it took me out of the experience. There exists some very horrible voice-overs of Japanese animation out there and you can do far worse than the Funimation dub of Dragon Ball that as to some people become neigh iconic and a preferred choice. That's the boat I'm in, as I have never been a big fan of especially Goku's original voice, while it's standard fare for women to voice main character in japanese animation, in the case of Son Goku I felt the actress let him be way too high pitched. As I said however, this version had the Funimation voice cast and they do a well enough job of conveying the characters and their emotions. Superior quality of the original series aside, this movie holds it's own among the dragon ball animated movies and is a fitting start for what would become one of the most popular animated series in the genre. A mix of a sweet and simple story, some nice comedic moments and a fair quality of the series staple of martial arts action scenes. Curse of the Blood Rubies may not be the greatest Dragon Ball story out there but it manages to be a fun animated kids movie and an entertaining nostalgia trip for long time fans.